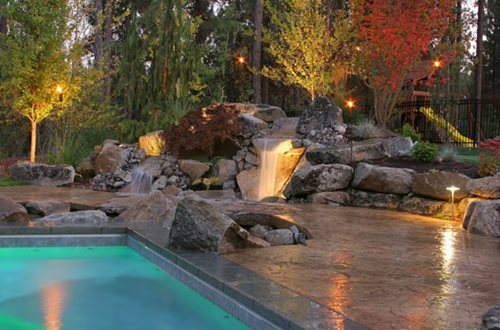 A combination of subtle downlighting for ambience with bold uplighting for flair gives depth to this landscaped area. Underwater lighting is used to highlight the waterfall. 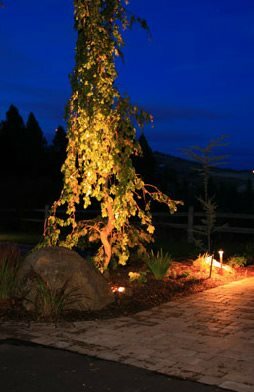 Plants with a weeping character or other interesting shape make a great focal point when uplit at night. However, unless you’re using LED lights which stay cool, don’t place your light too close to the leaves. Halogen lights can get hot enough to damage foliage. 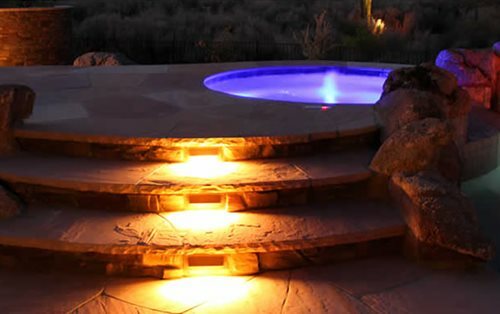 Louvered step lighting contributes to the ambience of this patio, and also provides safe passage to the pool. Louvered step lighting sits on the face of the steps and is tucked under the stone overhang so it shines downward instead of into people’s eyes. 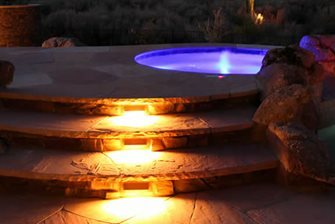 The underwater lighting in the backdrop makes the hot tub into a decorative feature. 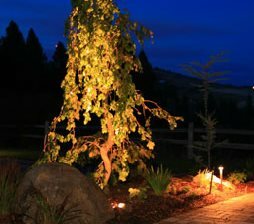 Low-voltage landscape lighting is an afterthought for most homeowners, but professional landscapers consider it one of the most important elements in the landscape. 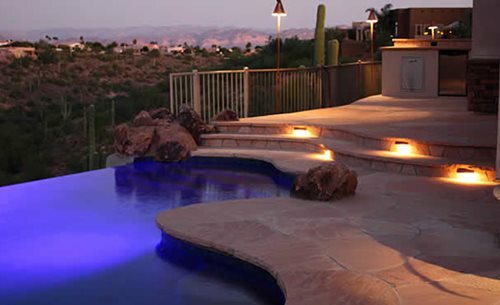 “We use lighting for three purposes,” says TJ Wilcoxson of Alexon Design Group in Gilbert, AZ. 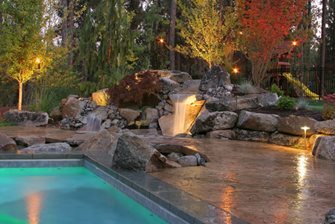 “To create atmosphere, provide safety by repelling burglars or vandals, and to light the way on paths, patios, and other places we spend time in the landscape.” Here, professional landscape contractors share their tips on using landscape lighting effectively. Line loss: Low voltage electrical systems are very susceptible to "line loss", the voltage drop caused by resistance in wire during transmission of electrical power over distance. Pathways and steps - “We call this traverse lighting because it helps you get from one place to another,” says Wilcoxson. Home and architecture - Barton suggests lighting your front entry, pillars and stone veneer. Water features - “There are underwater lights available that highlight the rippling water in a simple, classic way,” says Barton. Driveway - Few lights are needed on the driveway, since we all have headlights. The best tactic for lighting a driveway is to light the landscape alongside. Trees - Uplighting into trees creates bold shadows in the landscape, while downlighting from the top of a tree mimics the romantic effect of moonlight. Patio covers and pergolas - “A chandelier light fixture overhead feels inviting and creates ambience,” says Barton. Pathways and patios - “The functional areas always come first,” says Barton. This lets you actually spend time in your landscape after dark. Architectural features - DuBreuil suggests putting the focus on your home. “Pillars, stone and veneer make beautiful shadows and cast indirect light into the landscape,” he says. Focal areas - Every landscape will have its own unique features. Old twisting trees, waterfalls, or spiky plants are all dramatic candidates for lighting.